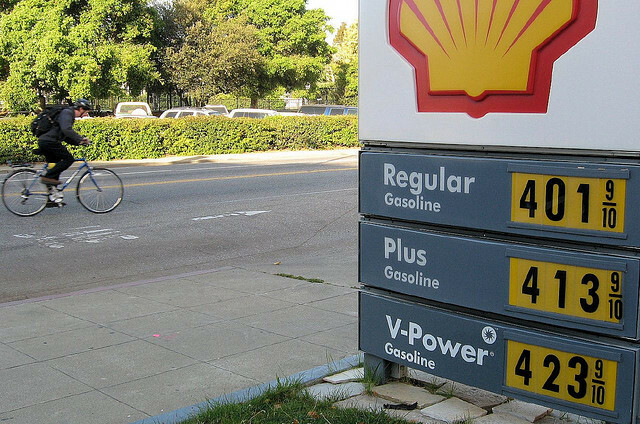 With gasoline prices and the effects of greenhouse emissions evermore evident, an integration of transportation, energy and climate policies is critical. Photo by richardmasoner. The New America Foundation hosted a discussion on transportation, energy and climate policy today in Washington, D.C., in an effort to investigate the role of policy on influencing behavior change and possible policy solutions to the U.S.’s increasing demand on oil. Titled, “Unconventional Wisdom: Rethinking Oil and Transportation Policy,” the discussion covered the integration of transportation, energy and climate under one comprehensive policy, the feasibility of its implementation and its effectiveness on improving quality of life. The panelists were Jed Kolko, associate director of research at the Public Policy Institute of California (PPIC); Deron Lovaas, federal transportation policy director at the Natural Resources Defense Council (NRDC); and Shin-Pei Tsay, director of the Leadership Initiative on Transportation Solvency at the Carnegie Endowment for International Peace (CEIP). The event’s moderator was Lisa Margonelli, director of the Energy Policy Initiative at the New America Foundation. Moderator Lisa Margonelli started the discussion with awakening statistics on the U.S.’s dependence on oil. Margonelli also acknowledged the level of controversy associated with possible policy solutions and the level of difficulty on agreement by pointing to the U.S. Senate’s recent decision against the Environmental Protection Agency’s ability to regulate greenhouse gas emissions. She concluded the introduction by presenting real-life examples from her project, Energy Trap, on how oil dependence has become a burden to individual families around the country. As for efforts in advancing transportation policy, Lovaas explained, the last federal bill to be passed was in 2005, where the previous bill had expired in 2003. Lovaas added that “it took about two years and a dozen extensions to finally get a bill” during times of booming revenue. Lovaas added to Margonelli’s earlier point on the difficulty of policy agreement by discussing the difference between the Administration’s suggestions for the 2012 fiscal year budget and the contrasting views of Congressman Paul Ryan (R-WI), as were presented yesterday. “[In Congressman Ryan’s version] the transportation program stands out as the biggest cut compared to President Obama’s proposed budget; it’s a cut of about 56 percent,” Lovaas said. In relation to other proposed cuts in the budget, transportation takes the number one spot right next to international aid, with a cut of about 50 percent, Lovaas continued. But these proposals are not the only ones in the works. Lovaas explained that Transportation and Housing Committee Chair Sen. Mark DeSaulnier is working on a version with his staff, and Environment and Public Works Chairman Sen. Barbara Boxer is working on another version with her committee. Another solution discussed to improving transit ridership was transit-oriented development. Jed Kolko’s approach to making transit more desirable is to better integrate land use with transportation policy, while still including pricing policies. According to Kolko’s experience with the California transit system, transportation policy alone is not effective enough to initiate behavior change. In fact, California’s initiative on expanding ridership for the transit system and reducing carbon emissions, SP 375, was also in an effort to combine the effects of transportation policy, land use and pricing. Even within a quarter-mile of a transit station, only 10 percent of employees relied on transit as a primary mode of transportation. According to Kolko, the traditional transit-oriented development model has mostly focused on housing near transit stations. But he argues that employment density near transit has a much stronger impact on transit ridership. This way, commuters have more opportunities to carpool or park-and-ride at the origin of their trips. “If you’re trying to maximize transit usage, and therefore achieve greater vehicle miles traveled (VMT) reductions, then it is more important to have jobs right near transit stations than housing, especially in incidents where you have to have a trade-off,” Kolko said. Historically, California’s reasoning in locating housing near transit stations has been to provide opportunities for affordable housing, especially since the commuters who are most likely to rely on transit are those who are low-income and the best candidates in need of such a program. Kolko further added that if reducing carbon emissions, instead of congestion, is the main goal, than centralizing transit in employment-dense areas is key, even more so than in areas of high density housing. Shin-Pei Tsay’s proposed solution was gasoline pricing. The Transportation Solvency Project, where Tsay is the director of the Leadership Initiative, has been conducting bipartisan independent analysis, trying to understand the relationship between behavior changes and pricing. Through her experience, Tsay was able to offer her ideas on an increase in crude oil tax. She supported Kolko’s earlier point on reducing VMT as an important factor for reducing greenhouse emissions, especially since vehicles contribute 80 percent to overall emissions. In terms of long-term fiscal policy, Tsay introduced her organization’s work on crude oil taxing, which would set gasoline prices at a fixed value and would determine the revenue generated through the fluctuations. But Tsay’s overall point was to focus funding and efforts on operations and maintenance of transit, as much as building and development. “[Current efforts] are very focused on capital construction but not on operations and management, but that is what makes the difference,” she said. Kolko later added to Tsay’s point on gasoline tax by highlighting the two incentives of the program: Increasing revenue in order to fund transportation and reflecting the externalities of vehicular traffic by discouraging driving and reducing emissions. He agreed that higher gas prices and higher taxes achieve this goal.